Berlin is greeting the news of the Four Power agreement to lift the blockade with unanimous relief. The Berlin crisis will not mean war as once was feared, but the West Berliners who have been opposing the Communists for the past eleven months still ask, "What is the price to be?" As the newspaper Tagesspiegel put it: "For us the blockade will not be lifted until we are able to proceed to Frankfurt, Hamburg, and Munich without an interzonal pass; when no 'people's policeman' and no Russian soldier can order us out of a train and make us disappear; and when neither the carrying of ten pounds of potatoes nor the possession of West marks will put us in danger of winding up in the uranium mines of Saxony." West Berlin's Mayor Ernst Reuter hails the agreement as a "first-class defeat of the Eastern politicians." Reuter says the next step for a unified Berlin is free elections for all of the city. But, he added, "This is just the beginning of a new tug of war between the East and the West." The Russian-licensed press on the other side of the town print the news of the agreement but offer no definitive comment. The Communist-dominated Socialist Unity Party of the East issues a communiqué this morning welcoming the decision to lift the blockade, saying that this is what the Soviet Union wanted all the time. The SED adds that this means an end to the plans of the Western German political leaders to set up a separate West German state. Now it remains, the German communiqué says, for the economic councils of the Soviet zone and the Western zones to restore normal trade relations. Tipping their hand on the future party line, the Russian-sponsored party made this appeal: "We ask that the Berlin population restore its democratic unity and fight for a just peace treaty in order to achieve a unified Germany and the resultant withdrawal of the occupation troops." The SED also is preparing a call for a Germany-wide plebiscite on a unified nation. From this it would appear that foreign ministers are going to hear a lot about a peace treaty and mutual withdrawal of troops when they sit down to discuss the problem of Germany later this month. 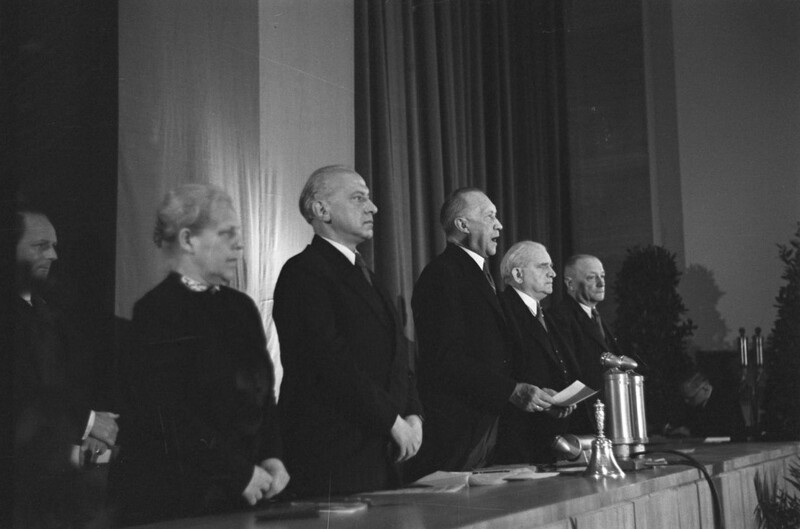 Dr. Konrad Adenauer, president of the West German constitutional convention, said lifting of the blockade would not affect work on the formation of a West German state. The blockade isn't lifted yet. Two American and one British correspondent are being held by the Russians after they attempted to jump the gun and come through Berlin last night. They were picked up at the Helmstadt border crossing point. American authorities are taking the usual measures to secure their release. General Clay said today that the airlift will continue on full operation until Berlin has a stockpile of 200,000 tons of food and fuel, just in case the blockade is stepped up again. Berlin welcomes the blockade lifting with "grateful suspicion." Grateful because this major international irritation has been removed and thus lessened the possibility of war. Suspicious because Germans most of all have learned the lesson of Marxist realism. In other words, the consensus is that the sudden Soviet turnabout and the new era of good feeling and sentiment is not a solution, but a tactic. From here it looks like the foreign ministers are going to rewrite or at least add to the Potsdam Agreement. There are two schools of thought: First, that the conference will fail for the same reasons it has always failed. Basically this is because we have two definitions of democracy and freedom. Another school of thought is that the Russians are prepared to go all the way—that they will accept a West German state as long as they can sponsor their own East German government, and that they want neutral Germany as a buffer and are willing to do almost anything to bring about an agreement to achieve this. One thing appears certain. According to the official Communist line now being promulgated, Vyshinsky is going to propose a peace treaty for all of Germany and the withdrawal of troops. The big dispute will come over "German unity." Perhaps the best reaction I have picked up from a Berliner came tonight from my housekeeper. When I said that the four powers had agreed to lift the blockade, she replied, "And how much did the Americans give in to the Russians?" The big question in blockaded Berlin tonight is what becomes of two and a half million people, one hundred miles deep in the Russian zone, who have been defying the Communist assault against the democratic political position here. West Berlin Mayor Ernst Reuter says "it is good," but that the issues are not settled. Free elections must be held in Eastern Germany. General Clay is not available for comment. The German Communists are happily claiming victory. 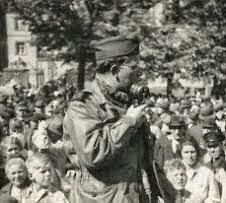 The British Commandant, General Robertson, declares that "West Berliners will have their interests safeguarded." And America's volatile commander for Berlin, General Frank Howley, remarks, "This agreement will not bring back the lives lost in the airlift." In other words, agreement to lift the blockade by the Russians does not banish the basic problems between East and West. To the people in Berlin, it means that the lights will not go off at nine or ten o'clock, instead staying on all night; that the wholesome but tasteless "Pom" dehydrated potatoes potatoes will disappear from the diet; that factories will reopen and trade resume. But as I said before, the cynical blockaded Berliner still wonders what the price will be. As I speak to you, the airlift continues to roll tonight. Today British and American planes completed the past twenty-four hours with a delivery of 8,900 tons of food and fuel to this city. The airlift will continue to operate until we have more than a preliminary agreement. So far the Russian blockade has cost twenty-three British and twenty-eight American lives—that's fifty-one altogether. The man who invented the airlift, General Lucius Clay, today gave a farewell review to his occupation troops. He said "the United States Army is in Germany, and will remain in Germany, as long as necessary to assure the peace." If we had achieved a Cold War victory in Berlin tonight—and that depends upon what the diplomats achieve—the major credit can be awarded first to the ordinary citizen of blockaded Berlin who chose the risky course of resistance while surrounded by totalitarian opposition. And second, for the physical achievement of this greatest of peacetime air operations. The United States Air Force and friends, from the highest flying captain to the lowliest Polish DP who unloaded the thousands of tons of coal, deserve the thanks of the democratic world.